Space planning is used not only to visualise a plan, but to ensure that the furniture originally specified makes the best use of the valuable square footage available. A good space plan takes into account not only the floor area, but the room’s aspect, the work flow and even the company’s culture. 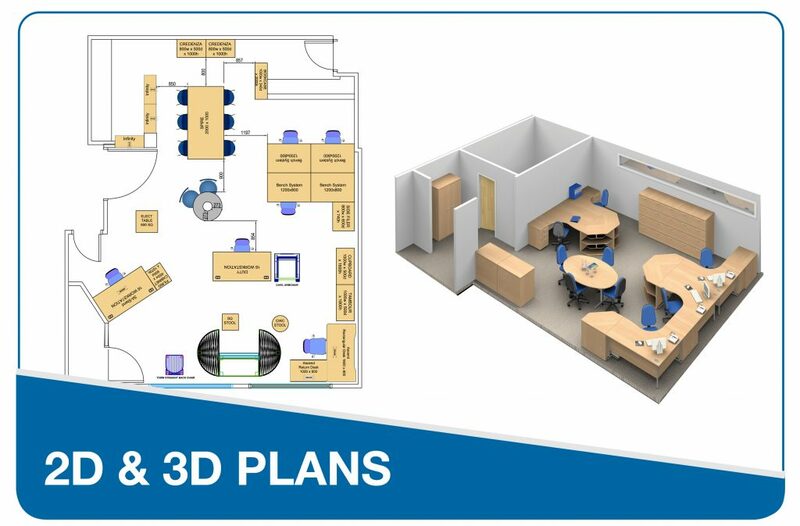 Not everyone can ‘see’ a plan in three dimensions, but with a little help and attention to detail, you can ensure you get the best outcome from space planning, whether 2D or a full 3D visualisation. Our experienced team work on many plans every week and we asked them what top tips they could offer to help you get the most out of space planning. Measure, then measure again. Simple errors can have a big impact so check that you have included all doorways, pillars, alcoves, and windows. Standard practice is to give measurements in millimetres, but whatever system of measurement you use, be sure to be consistent. A wall in metres, and a door in feet and inches can cause a great deal of confusion! A room is not an empty shell, so don’t forget fixed position heaters, radiators, floor boxes, perimeter power, fire extinguishers, or pipework. And when measuring, be sure to note vertical heights, for example where a window is lower than standard desk height. Environmental nuisance; air conditioning is great, but not for the person sitting right underneath the unit when everyone else is wanting the temperature turned down, or up! And whilst we all enjoy the sunshine, consider the room’s aspect, and the placement of computer screens relative to direct sunlight. Real spaces for real people; what kind of working environment do you want to create? Do people need quiet units in which to concentrate on detailed work, do they make noisy calls in a hot sales environment, or do they need to collaborate as a team and feel included in a group? The kinds of desks you specify, and how they interact in the available space, can make a big difference to productivity. Throughfares and breakout areas – we know that sitting down all day is bad for our health, so consider offering different areas within the workplace; mobile workstations, standing meeting and breakout areas will all contribute to a more dynamic environment. But don’t go and place the person taking client calls right next to a busy break out area, or a noisy printer! If you are able to provide a scale drawing this will help to speed up the process and improve accuracy. However our team are here to add value to the process and will review all requests with an eye to improving layout and use of space. To help you next time you're reviewing a project, download our space planning top tips to share with your team. The best knowledge can often come from those who will work in the space you are creating.